Tailwater, Balsam and Caster Series ; Revolutionizing value and performance for custom built rods. Blue Ridge Tail-Water Series Rods and blanks. Extremely light, fast action rods and blanks designed for fishing. Continuous external taper, combined with multi internal tapers and multi-modulus graphite, these ultra light, fast action rods are designed to work at rated line weights. They handle great at 30' and can shoot line 100'. Built with our TiCh ceramic guides, custom grips and nickel silver reel seats with mortised exotic wood inserts, these rods are truly top of the line at value prices. These rods are comparable to "commercial" rods selling for over $600.00. Try it, you will like it! Blue Ridge Balsam Mountain Series Rods and blanks. Very light, moderately fast action rods and blanks for the angler that has a more relaxed casting style. Designed like the Tail Water Series, these rods combine multi internal tapers with state of the art graphite and resin systems to produce a rod that is equally at home throwing 30' or 100' of line. Built with ceramic stainless guides, nickel silver plated reel seats with fine wood inserts and flor grade grips, these rods offer more value than any other rod on the market. Blue Ridge Caster Series Rods and blanks. Moderate to moderately fast action rods and blanks, built with the same care and craftsmanship of our higher modulus rods and blanks. These are perfect rods for the beginner because they offer quality and castability upon which good casting habits can be built. The Caster Series offers value found nowhere else in high quality, custom built rods. 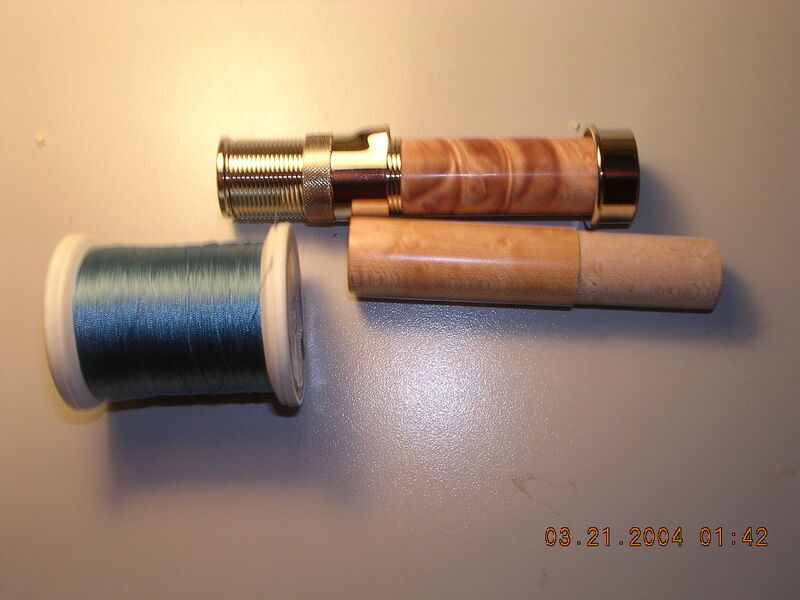 Built with stainless stripper guides with blue rings which match the color of the blank, single foot wire guides and reel seats with exotic wood inserts, these rods offer the most value of any rod in the $150.00 to $200.00 price range. This is your custom rod. You specify the components: grip style, reel seat, guide type, thread color as well as weight and length. Tail Water Series and Balsam Mountain Series rods are built on US made blanks. Caster Series rods are built on imported blanks. All are first quality blanks that perform equal to or better than similar rods built by major manufacturers, but they cost you a fraction of the price you would normally pay. The quality of the workmanship and components are typically superior to comparable factory produced rods. Your satisfaction is guaranteed. If you are not happy with the rod, return it before you fish with it for a full, no questions asked, refund. Cordura covered rod cases w/ internal rod sock available for $25.00. Pricing Examples: All four piece rods rods. E-Mail us with your specific needs for an exact, customized quote. Rods in all series can be customized to your personal specifications. Most lengths and sizes are available. This is your custom rod. E-mail for availability, Series description and an exact quote. Rod kits also available. E-mail for a quote. Rod delivery is approximately four weeks. We build the rod for you in Hickory, NC.